As we mentioned in our 2.5 release notes, the Gutenberg editor is now the default text editor for WordPress 5.0. 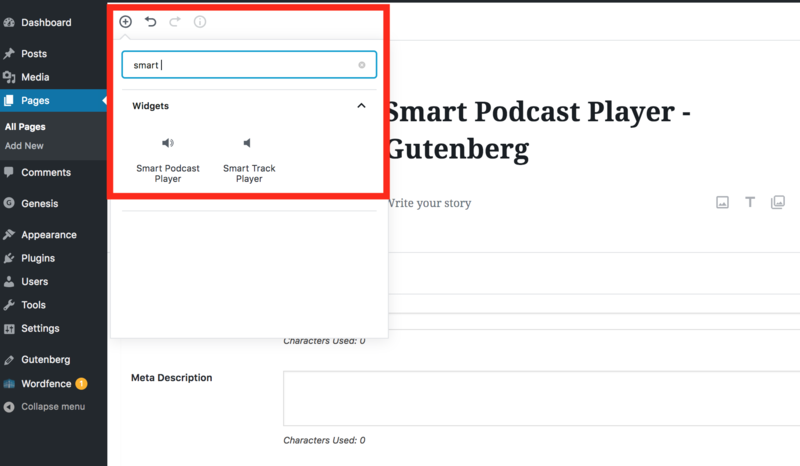 This support article will walk you through how Smart Podcast Player works with the Gutenberg editor, as it's a bit different from the previous editor (TinyMCE). Gutenberg compatibility is now available in Version 2.6. Click the Add Block button (circle with + sign in the middle) in the upper-left corner of your page builder. Look for Smart Podcast Player or Smart Track Player, depending on which builder you need. You'll find it in the Widgets section. You can also search for the two builders. 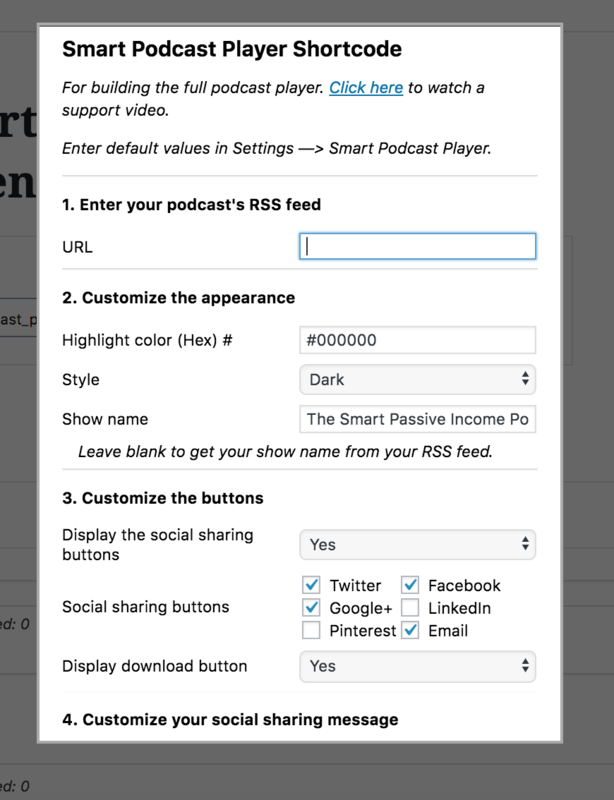 Type the word "Smart" and Smart Podcast Player and Smart Track Player will appear in the Widgets menu. Click on the drop-down menu (upper-left) and click Show Block Settings. 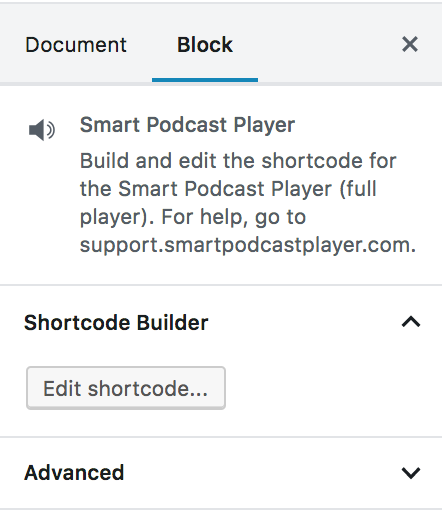 After you click Show Block Settings, to the right you'll see a new menu for the Smart Podcast Player, with the shortcode builder. Click Edit shortcode to open up the shortcode builder menu you are familiar with. When the "edit shortcode" button is clicked, the selected options should reflect first what's in the shortcode text, and if an option is absent, the defaults from the settings page will apply. When the "build shortcode" button is clicked, the resulting shortcode text should reflect the options selected in the builder. 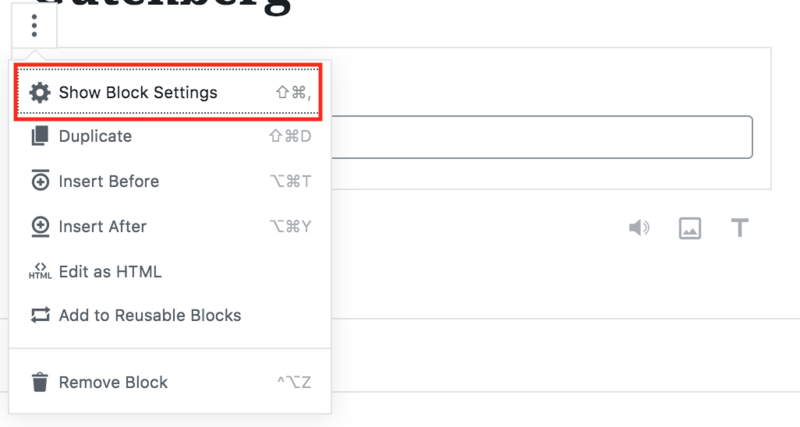 If an option in the builder is the same as the defaults from the settings page, that option should be absent from the resulting shortcode.